Hatem Ben Arfa is why YouTube was invented. If the boss isn’t about and you have some down-time at work today, type his name into the website, sit back and watch a master-class of football. All the tricks are on show. The drag-backs, feints, a nutmeg or two. Some of the goals are simply wonderful. Ben Arfa had this wonderful way of fooling his opponents into believing he was going to shoot, so they went to block, only for him to stand on the ball and make them look foolish. The use of the word ‘had’ is no accident. Because were it not for the internet, none of us would ever see Ben Arfa in a black and white shirt again. On Tuesday night, as the game flagged and sobriety threatened the young, more vocal element of the 852 Newcastle United fans at Oldham Athletic’s Boundary Park, they reverted to an old classic in an attempt to keep things going. Ben Arfa’s name was chanted. Just for a bit. There are some out there who still love him. Although in truth it wasn’t a million miles away from being half-hearted. Even those who can see no wrong in anything the Frenchman does have started to lose interest. There are new heroes to concentrate on. Ben Arfa wasn’t at Oldham. Mehdi Abeid and Mapou Yanga-Mbiwa were and they could leave the club as early as this week. Remie Streete, Rolando Aarons, Haris Vuckic, Gael Bigirimana and Sammy Ameobi all got some game-time. If Ben Arfa can’t even get a game in the first pre-season friendly in front of those names, then he’s hardly going to be let loose on Manchester City on the first Sunday of the new Premier League season. 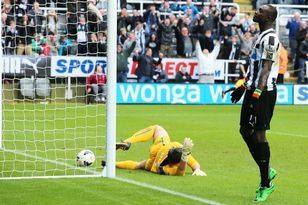 It would take a U-turn that would make even a politician blush for Ben Arfa to be given another chance by Alan Pardew. In March, the manager said: “I’ve not lost patience with Hatem. I don’t think I’ve ever done that with any player. That remaining patience has gone. No matter where you sit on the great Ben Arfa debate, I think we all now have to come to terms with the fact he has played his last game for Newcastle United. When you have been dumped into the reserves, along with Sylvain Marveaux, and told not to look out the passport for the upcoming trip to New Zealand, your time is up. There are many who believe the fault for this situation lies entirely on Pardew’s shoulders. “A better manager would built a team around out best player,” they say. It is a weakness of the Londoner that he hasn’t got the best from his No 10. Although it has to be said that this was not a problem the 2011/12 season. Only a year ago, Pardew spoke about getting inside Ben Arfa’s head using psychology to bring out the hidden genius in the man. More, it needs to be said, are coming around to the thinking that at 27, the Frenchman may be a spent force. That while he is a talent, he is too flawed a character. And that when you look at his past history, Ben Arfa and trouble have never been far from one another. At Lyon, he squabbled with team-mates Sébastien Squillaci and Karim Benzema. Then he had to make a public apology to Didier Deschamps after a training ground disagreement at Marseille. Then came the ugly disagreement with Laurent Blanc at the European Championship two years ago. And now we have a situation where the relationship between himself and Pardew seems broken beyond fixing. After so many fall-outs, maybe it’s time for Ben Arfa to look at himself in the mirror and ask: “Is it me?” There is only one way for Ben Arfa to prove that he has been misused at Newcastle. Or ‘Pardewed’ to borrow a phrase so favoured by the manager’s critics. And that is for him to get a move, play regularly and produce consistent moments of brilliance which we all so enjoyed a couple of seasons ago. But will he bounce back? If Ben Arfa does get his move, and there is hardly a queue down Northumberland Street of suitors, and finds his best form with another club, it will reflect badly on Pardew and Newcastle. But why do I get the feeling that we have already seen his best and this is a career that will be forever seen as unfulfilled?